It’s Friday and I’m ready for the weekend as I’m sure everyone else is. 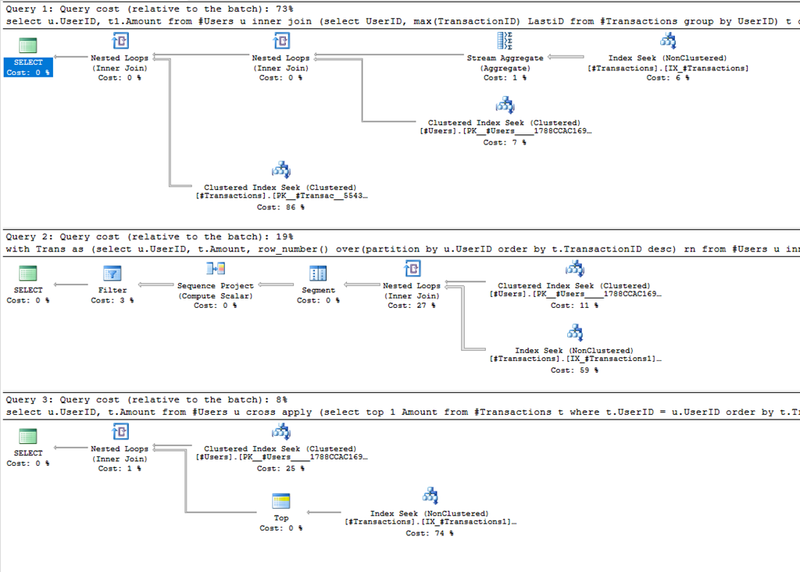 This weekend I’m looking forward to getting yard work done and browsing through the whoisactive SQL Ops Studio extension code. I plan on writing a few posts on creating extensions; but, before we get to those I’d like to share a tip from one my my Co-workers at DBBest. 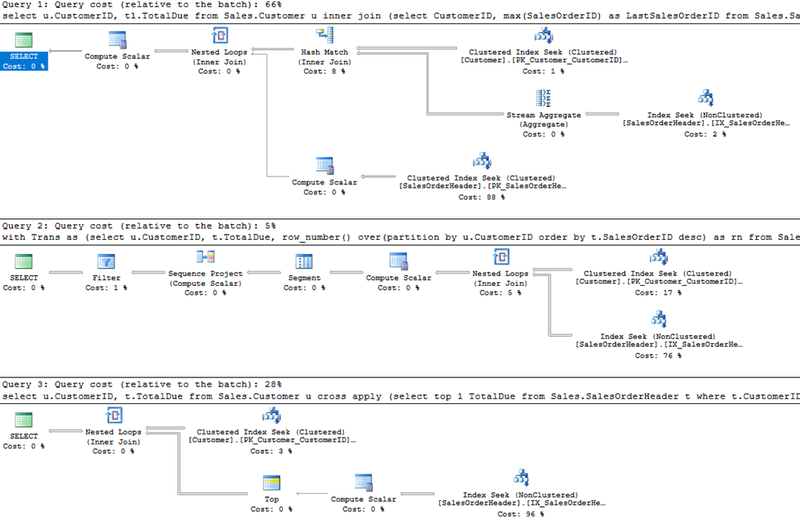 Recently we were doing a project that heavily focused on query tuning and many tables had various outer joins. My co-worker pointed out that many of these could be converted to an apply rather than a join. Apply gives you both CROSS and OUTER. Think of CROSS APPLY like an INNER JOIN and OUTER APPLY like an OUTER JOIN. Let’s compare some code to see how APPLY stacks up. For this we’ll be comparing a derived table, CTE, and APPLY. We want to get the Amount for the last transaction for a certain range of customers. Next, we want to run the queries with STATISTICS IO ON. The results are quite surprising indeed. The query plan shows a much lower cost for the APPLY and the IO reports slightly fewer as well. What if we look at “real” data. I mean demo data is fine and dandy but it’s often not representative of the real world. I could fill a database with realistic data using dbForge Data Generator but for this scenario I’ll use AdventureWorks2012. HAHA! Yes, I know I said “real-world data” but let’s look at AdventureWorks anyway. *note that some of you may point out that a join isn’t needed at all since CustomerID is in Sales.SalesOrderHeader. I typed this up and then thought about it and let’s say instead you want to use u.AccountNumber. The query results are the same and now you have reason to use the Sales.Customer table. We’re still looking at a specific group of customers and getting a list of their totaldue for the last transaction. How does it turn out? This shows that the CTE is actually the lowest cost; but, what if we look at the CPU and IO used with SET STATISTICS? 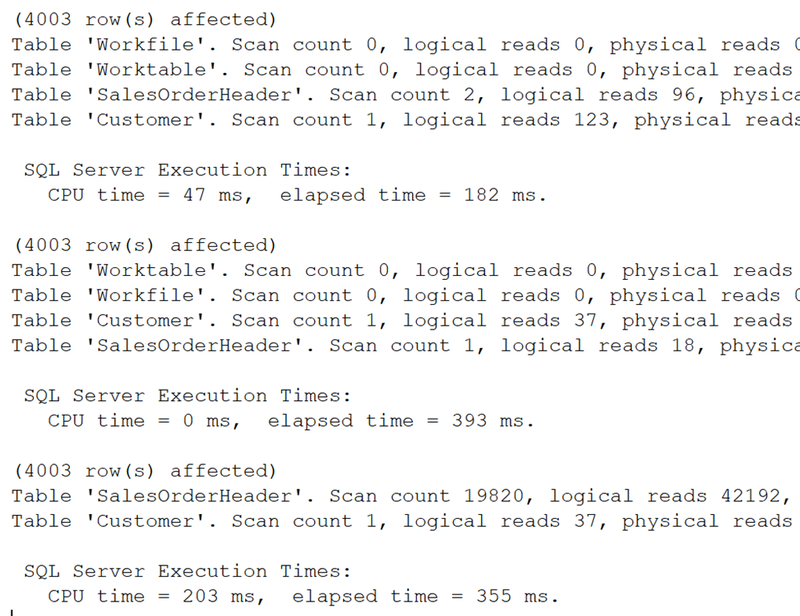 What we find is that the APPLY uses 1 fewer IO and elapsed time is consistently 0 ms. The CTE has 1 more IO and is consistently greater than 0 ms and the derived table has significantly greater IO. APPLY can be used to enhance some queries. Note that your mileage will vary and you should always test before blindly making changes. A good example of where you probably shouldn’t use apply is when we change the queries to look between certain dates. Date is on the joined table not the customer and this makes a big difference. Note that the APPLY in this scenario is dreadful; so, be sure test! I hope you found this article useful and it adds to your query tuning kit. Have a great weekend!